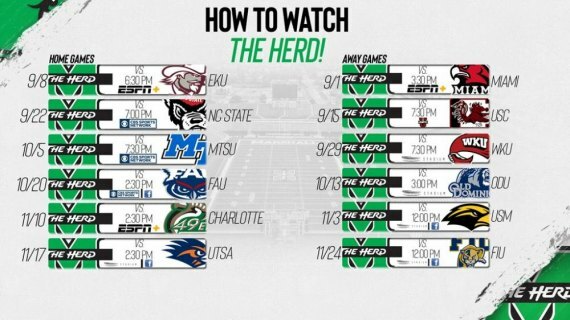 Marshall Football as well as other Thundering Herd Athletics broadcasts will be streamed live on ESPN+ this upcoming season. With the fall sports kicking off, here is a guide on how to subscribe and watch so you never miss a minute of the action. A direct-to-consumer (no cable or satellite subscription needed) streaming service that will cost $4.99 per month. As part of the launch ESPN+ was integrated as part of a completely redesigned ESPN App (and also via ESPN.com). Subscribers will receive thousands of additional live events, and original shows and films, and an on-demand library, which is not available on ESPN's linear TV or digital networks. ESPN+ will not include access to stream ESPN's existing, linear networks (which will continue to be available via "TV Everywhere" authenticated streaming). ESPN+ costs $4.99 a month ($49.99, if you pay annually). A 7-day free trial is available, too. No. The $4.99 a month covers events from other college and pro sports. Will fans have the option for a "C-USA only" subscription?" No. For the $4.99 subscription price, they will get access to the Conference USA content, and thousands of other events, plus original shows, series and an unmatched library of on-demand sports content. The ESPN App is still free, and you get all the same news, info, highlights and audio as always – with a new, enhanced design. Users can still stream ESPN networks with a pay TV subscription, for no additional cost. Users also have a new option to subscribe directly to ESPN+ ­— which contains 1000's of additional live events, on-demand content and shows — not available on ESPN's traditional TV networks. A subscriber can watch ESPN+ in the Watch tab of the latest version of the ESPN App, available on the web, iPhone, iPad, tvOS, Android Handset, Roku, Chromecast, and FireTV. Change credentials on ESPN.com by accessing the user avatar in the upper right corner of the website after signing in. Yes, you can cast ESPN+ content from your mobile device to your TV set (note: not all set-top TV devices have the ability to cast). However, ESPN+ content is intended only for personal non-commercial use. Please see the restrictions in the ESPN+ Subscriber Agreement for more information. What are the details of the ESPN C-USA Deal? There will be over 175 C-USA events on either ESPN+ or ESPN3. More than 100 of those games will be available on the brand new ESPN+. ESPN will air approximately 45 football games, 60 regular season men's basketball games and 28 regular season women's basketball games. Is ESPN+ and ESPN3 the same thing? No, ESPN+ is a subscription based package that you can cancel at any time, while ESPN3 comes with most cable or TV packages. YOU DO NOT RECEIVE ESPN3 with an ESPN+ subscription. No, our television partners decide where the games will be streamed. All streaming providers as well as the game times have been set for the 2018 Marshall Football Season. Click here for all the game times and streaming providers for all upcoming football games.